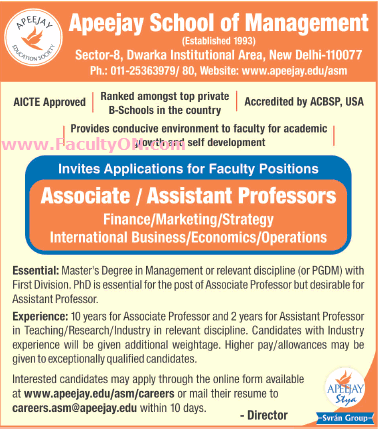 Apeejay School of Management, New Delhi has advertised in THE TIMES OF INDIA newspaper for recruitment of Associate Professor / Assistant Professor jobs vacancies. Interested and eligible job aspirants are requested to apply within 10 days from 08th August 2018. Check out further more details below. About College: In its endeavour to establish a truly international level Centre of Excellence in Management and Information Technology, the Apeejay Education Society established the Apeejay School of Management (ASM) in 1993. The ASM strives to develop competent and relevant manpower for the twenty first century needs of trade, business, and industry. Master Degree in Management or relevant discipline (or PGDM) with first division. Ph.D is a must for the post of Associate Professor but desirable for the post of Assistant Professor. How to apply: Interested and eligible candidates are requested to apply online at the official web address provided below or email applications to the given email address.